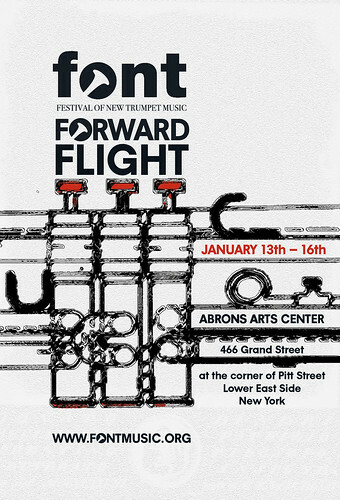 The Festival of New Trumpet Music (FONT Music) will present Forward Flight, the third and final event of its 7th annual performance season, from Wednesday, January 13th through Saturday, January 16th at New York’s Abrons Arts Center. This four-day celebration of the eclecticism of the trumpet in contemporary music, curated by Dave Douglas and Taylor Ho Bynum, will feature events on two stages, including performances by a diverse range of ensembles, three free FONT Music Workshop Series events and an opening night tribute to unheralded veteran trumpet player, Wilmer Wise. The program will include world premieres of music from the New York-based composers collective Anti-Social Music (ASM) and composer David Sanford, whose piece, “Seven Kings”, was commissioned by FONT Music with support from Chamber Music America to be performed by the Meridian Arts Ensemble with guest soloist Dave Ballou. And, The New York Trumpet Ensemble, directed by Mark Gould, will present the New York premiere of Charles Wuorinen’s Brass Quintet. Headlining events will include indie folk band The Low Anthem with a special appearance by Dave Douglas, a celebration of the Chicago Underground Duo’s new CD, Boca Negra (Thrill Jockey), a rare performance of Ornette Coleman’s “The Sacred Mind of Johnny Dolphin” by Wilmer Wise and the American debut of the Open Circuit International Trumpet Ensemble, featuring an all-star cast of trumpet players from America, Austria, Japan and France, presented with support from CMA/FACE French-American Jazz Exchange.